Don't just turn heads.... CREATE WHIPLASH on metal surfaces! BLACKFIRE Wet Diamond Metal Acrylic Sealant protects all metal surfaces with a revolutionary combination of acrylic and Wet Diamond polymers that withstand heat and bond to metal surfaces – perfect for auto use. BLACKFIRE creates an extremely slick finish that sheds water effortlessly, helping to prevent water spots. BLACKFIRE Wet Diamond Metal Acrylic Sealant prolongs the beauty of just-polished metals and maximizes the time between polishing. BLACKFIRE Wet Diamond Metal Acrylic Sealant is designed for protection of daily drivers and any metal surfaces that regularly come into contact with the elements. The coating minimizes maintenance and keeps metals looking good. If you've just spent the last eight hours polishing your Airstream trailer to a bright shine, you want to keep it looking that way for as long as possible. BLACKFIRE Wet Diamond Metal Acrylic Sealant is a modified version of Wet Diamond All Finish Paint Protection, designed to protect polished bare metals like aluminum. It seals the finish under a protective, transparent, acrylic shield. This shield helps protect against the effects of weathering, salt air, pollution, bug remnants build-up, and UV deterioration. BLACKFIRE Wet Diamond Metal Acrylic Sealant is great for protecting billet aluminum, plated, anodized and/or clear coated wheels. The super-slippery finish resists brake dust bonding, which makes future cleaning easier. 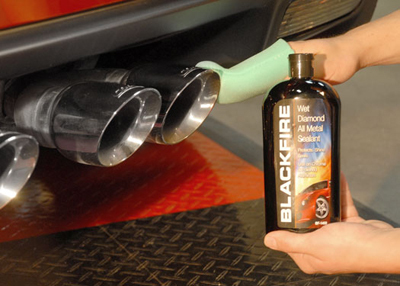 Apply BLACKFIRE Wet Diamond Metal Acrylic Sealant to all clear coated, plated, and bare metals. BLACKFIRE Wet Diamond Metal Acrylic Sealant contains the latest generation of Wet Diamond tri-polymers for both brightness and durability. In moderate climates, one application will protect for six months. In climates of severe heat and UV, reapply every 4 months. Treated surfaces have a slippery feel and will sheet water (free-flowing water, nozzle off the hose). When water stops sheeting and starts to "puddle" it is time to reapply. Work on a cool surface out of direct sunlight. Apply a nickel-size amount of product on a dry foam or microfiber applicator pad and wipe on the surface using small circular motions. Allow Wet Diamond to fully dry before buffing. Buff off film with a clean microfiber towel. Attach a dry Lake Country CCS White Foam Pad to your machine using a 6 inch Hook-and-Loop Backing Plate. Set the Porter Cable 7424XP's speed dial to between 3-1/2 and 4. Work on areas of 2 to 3 square feet. Apply two 8 inch lines of Wet Diamond All Metal Sealant to the metal surface. Spread sealant over the surface using the foam pad with the machine off. Place the foam pad on the surface and turn the machine on. Go over the area once in a left-to-right motion and once in an up-and-down motion until the sealant starts to dry. Allow a slight haze to form. Buff off residues by hand using a clean microfiber buffing cloth. If possible, work on a cool surface out of direct sunlight. Attach a dry, foam 8-1/2 inch Metal Sealing Pad or foam finishing pad to your machine using a 7 inch Hook-and-Loop Backing Plate. Set the machine's speed dial to 1000 rpm. Buff off residue by hand using a clean microfiber buffing cloth.